Wild Ferns's Manuka Honey Whitening Cream is concentrated creme containing premium certified Manuka Honey 80+ and is based on natural ingredients to help diminish the visibility of uneven skin tone while energizing and rehydrating your skin at the same time. 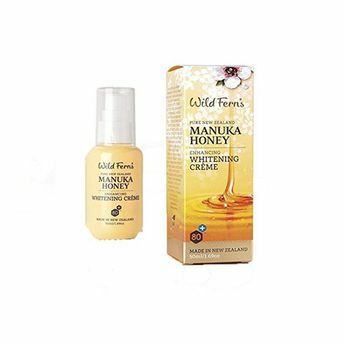 Your skin naturally creates melanin, but sometimes produces more than normal which creates pigmentation. A blend of Cherry Blossom to stop Melanin production plus Pomegranate and Licorice Root Extract assist to reduce patches of pigmentation and age spots.